The Cheyletiella parasitovorax mite can cause flaky skin and hair loss in pet rabbits. While the mites can be transmitted to humans, such infections usually pose no major health risks and resolve in a few days. Occasionally, a pet rabbit might develop what is known as “walking dandruff,” manifested with skin flaking and blotchy loss of fur. Though the telltale symptoms can often be identified by the naked eye, the parasite can sometimes be difficult to diagnose. When a veterinarian determines a rabbit has fur mites, that means the animal has been infected with the Cheyletiella parasitovorax mite, a small pest related to the mites that affect cats and dogs. Rabbits typically have a small number of benign fur mites even when healthy. Changes in habitat or other physical problems can cause an outbreak. People with compromised immune systems and young children suffer an increased risk for infection by rabbit fur mites. If a human does pick up an infection from a rabbit with mites, the duration will likely be short. The mites cannot penetrate human skin to lay eggs, so infections only last until the mites die -- 10 days at most, according to a 1992 report in the “Pediatric Infectious Diseases Journal.” So unless mites continue to be picked up from the source animal that remains infected, humans should be mite-free relatively soon. 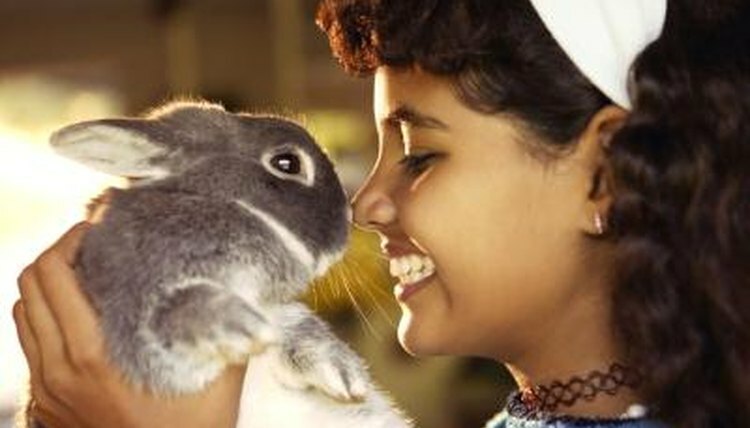 To minimize the risk of becoming infected with mites from a pet rabbit -- or any other disease carried by a pet -- the Centers for Disease Control and Prevention recommends thoroughly washing your hands after handling an animal or its bedding. The rabbit’s cage and habitat should also be cleaned frequently until the infection subsides, as eggs or larvae can re-infect the animal. Cheyletiella parasitovorax infection in humans manifests as mild skin irritation. Infections usually occur on the arms, torso or thighs, and include small, red bumps and/or itching at the site of infection.